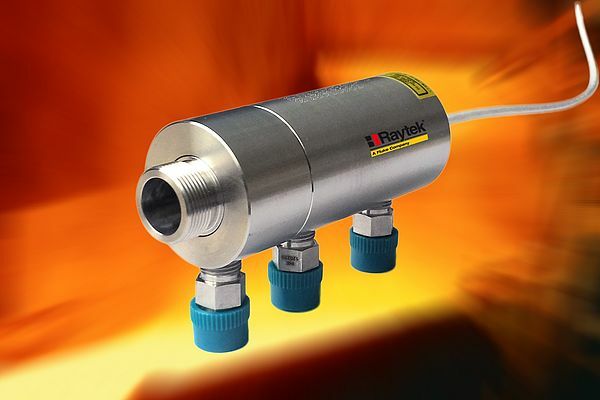 With the latest system expansion, MI3100 pyrometers from Raytek keep a cool head even in high-temperature applications. The new water-cooled stainless steel housing extends the ambient temperature tolerance to 180 °C. Delivery includes an air purge collar. With 35 mm in diameter and 73 mm in length, the housing can be easily integrated even in applications where space is limited. Two spectral models each cover a temperature range of 500 - 1,800 °C (1 µm) and 250 °C - 1,400 °C (1.6 µm). An integrated laser sighting facilitates positioning and aiming. Modbus, Profibus, Ethernet, und Profinet communication boxes are available for connection to the control level, as well as a model with four galvanically isolated analog outputs. Up to eight measuring heads can be connected to a single MI3 communication box. Digital communication between sensor and box and the patented automatic head detection enables plug and play. The shortwave pyrometers are particularly suitable for use in secondary metal working and processing, and for manufacturers of ovens and heating systems.